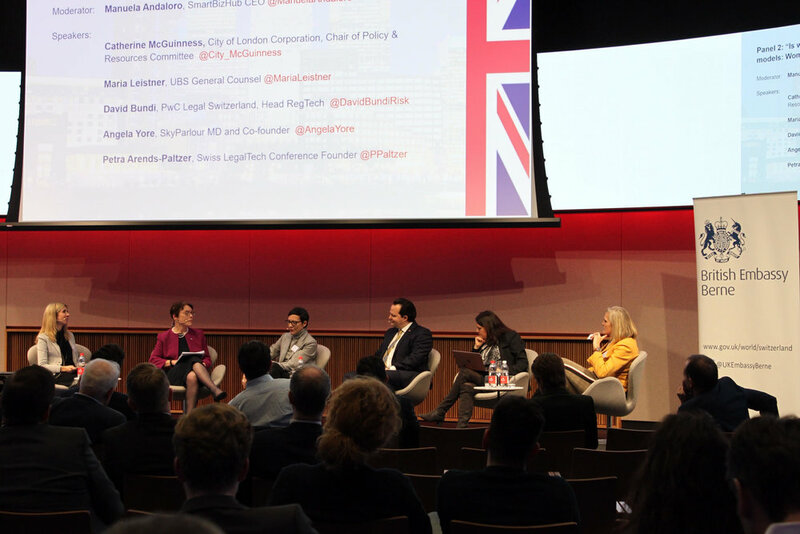 The 4th UK FinTech Mission to Switzerland on January 24th 2019 brought together high-ranking government representatives, Swiss financial innovators, successful UK FinTechs, and leaders for the two thought-provoking panel discussions. This week I had the incredible privilege of hosting as master of ceremony and moderating one of the most important events in the annual calendar of Swiss financial institutions and UK-based successful FinTech companies: the 4th UK FinTech Mission to Switzerland. On January 24th, 2019, the UK FinTech Mission to Switzerland, organized by the Department for International Trade, brought together high-ranking government representatives, Swiss financial innovators, successful UK FinTechs, and famous leaders for two thought-provoking panel discussions. Strong numbers behind a successful platform. The three previous events generated over CHF 50 million in signed business and provided a strong business platform for over 150 attendees. The 4th mission saw 28 UK and 33 Swiss companies present, discussing innovation and future impact on society in the over 115 one-to-one meetings that took place. The driving forces that helped shaping success. High-ranking government representatives, including Jane Owen, Her Majesty’s Ambassador to the Swiss Confederation and non-resident Ambassador to Liechtenstein, Catherine McGuinness, Chairman of the Policy and Resources Committee, City of London, leading Swiss financial representatives, such as Jos Dijsselhof, CEO of SIX, Switzerland's principal stock exchange, Noel McEvoy, Director Department for International Trade and the Scottish Development International for Switzerland and Liechtenstein, as well as senior representatives of the British Embassy Berne and the British Swiss Chamber of Commerce, were present and played a key role. Why do such events generate such great interest? As Jos Dijsselhof stated, the anwer is simple: because together we are stronger. Such strong platforms stimulate new business relationships amongst participants, resulting in job and wealth creation in Austria, Switzerland, Liechtenstein, and in the United Kingdom. Is the current political turmoil a threat? What about Brexit? Jos addressed the topic in reassuring but careful terms: “what we do know is that with the UK's exit from the EU, Europe and the UK likewise face significant challenges – in both political and economic terms. We are discussing these challenges of Brexit, the risks – as well as the opportunities – for the financial industry, at length here with our peers in Switzerland. What remains undisputed is that the UK and Switzerland are significant economic and trading partners. If I were to quote just one figure, it would be this: each day there are over 80 direct flights between Switzerland and the UK. Both countries benefit immensely from these close relations. Swiss companies provide around 93,000 jobs in the UK, while British firms account for about 27,000 jobs in Switzerland. This means that significant disruptions must be avoided and that UK and Swiss financial service providers need to be able to continue doing business after Brexit in the same way as before. In a first step safeguarding the status quo and legal stability is essential. Why Switzerland? Switzerland is to a certain extent destined to innovate. And it does so very well: Global Innovation Index named Switzerland to be the most innovative country in the world, not once, but seven times in a row. Many CEOs talk about the importance of innovation, but do they walk the talk? What are they doing in specific terms? How is SIX driving innovation? SIX has recently launched a venture fund worth 50 million Swiss Francs - around 38 million Pounds. The aim is to promote innovation in the Swiss financial sector. The Innovation Team is developing services for shareholders and the Swiss financial center. Let’s talk societal impact. “Our noblest task as entrepreneurs is to bring people together – across all cultures and languages, across all borders, despite potential political difficulties.” concluded Jos Dijsselhof. Business does not divide people; it unites them. It invests in innovation and helps to ensure that new ideas spread around the world. Ideas that benefit as many people as possible. What is the current status quo of the relationship between Switzerland and the UK ? A very interesting update came from Noel McEvoy, Director Department for International Trade, who confirmed how vital is assuring continuity, to ensure this, only last week 5 agreements were signed while all efforts are being made to keep the dialogue going between the two largest financial centres in Europe, such as London and Zurich. “Both nations are keen to grow and collaborate to ensure increased prosperity, and there are dialogues taking place on mutual market access.” he confirmed. Continuity and EU. At present, relations between Switzerland and the UK are largely based on the bilateral agreements with the European Union, which will cease to apply to the UK after its withdrawal from the EU. In preparation for exiting the EU, the UK has initialled five bilateral continuity agreements with Switzerland, covering trade, citizens’ rights, non-life insurance, land transport and air services. The bilateral continuity agreements replicate the existing EU-Switzerland arrangements as far as possible and will come into effect as soon as the implementation period ends in January 2021, or on 29 March 2019 if the UK leaves the EU without a deal. How do we keep driving sustainable change? One of the key discussions that took place on stage saw an incredibly knowledgeable line-up of top experts in their respective fields, such as Stephen Ingledew, CEO, FinTech Scotland, Katharina Bart, Contributor, Finews Senior, Gavin Littlejohn, Chairman of FDATA Global and Convenor of the Fintech Stakeholder Group of the UK Open Banking Implementation Entity, Keith Phillips, Executive Director, The Investment Association, Michael Coletta, Blockchain Developer Emerging Technology Lead, London Stock Exchange Group. The goal of the panel was to portray the new financial landscape, acknowledge its driving forces, such as customer demand and client savviness, and discuss predictions on themes such as blockchain, international payments, machine learning, Internet of Things, and AI. Q. Stephen, as CEO of FinTech Scotland, if you look at the FinTech ecosystem, at the fusion of financial services and technology, what do you think it can deliver from a social and societal impact perspective, in the short and long term? A. Fintech is a movement, economic and social, it is vital to access new consumers who may not have been served in the past. It brings a diverse range of societal benefits, inclusion, and diversity. Q. Katharina, customer demand seems to have shaped the industry. How do you see the role played by women and younger generations in finance? A. SRI (sustainable and responsible investing) and women are the Holy-grail in FinTech. Another aspect is diversity and inclusion, some way to go but over the past couple of years we have witnessed positive change and increased awareness. Another aspect is the fragmented provision of services in FinTech. It is a fast moving sector and trends change quickly, the new generation should not be seen as disloyal, they are simply savvy, choosier and more sophisticated. Q. Gavin, in Switzerland, historically a conservative financial centre, the adoption of open banking has so far been very limited. How do you think open banking will benefit society as a whole and solve the ever growing challenge of complexity, when it comes to having access to the right product or solution at the right time, for example? A. In a complicated product, a simple product is waiting to come out. Complexity drains the UX of benefits. Open Banking is a waypoint to further opening of the financial system. In my opinion pensions will next on the agenda. Collaboration is vital, it enables the industry and leads to enabling enabling technologies. Q. Keith, if we think at the FinTech applications across the whole value chain, where do you see the most significant disruption coming from? A. The investment association is focused on the buy-side in FinTech, RegTech and WealthTech. Social mobile tech will likely be a major disruptor. A cluster of FinTech is focused on data, possibly a wave of disruption from that front too. Q. Michael, what do you envisage for the future of FinTech? Where will real disruption (if at all) be coming from? A. In terms of disruption, blockchain is not as great as is often made out to be. Disruption occurs in financial services as part of a complex ecosystem. Could a FinTech really disrupt and displace a large infrastructure player? Maybe but unlikely. Q. When will FinTechs be judged like the large established players? Gavin: It is a fundamental shift, they will be judged differently as per the current environment. Q. Is it fair to judge the customers as loyal or disloyal? Were they ever loyal? Katharina. Yes, they are simply savvy consumers. A semantic issue. Personally, I have been looking for a new bank for 18 months—still looking. Am I disloyal? No. Gavin. Inertia Tax comes to mind, we should be looking at how to reduce the inertia tax (extra costs incurred and months spent looking for a different solutions) and friction. Q. There seems to be a lot of energy and excitement around Open Banking. How do you measure the success of OB (since launching 12 months ago in the UK)? Gavin. It is a process that will accelerate over the next 12 months. The shift to APIs is increasing in speed, so API growth will be a measure. Panel 2: Is work working against us? Establishing new role models: Women in New Finance , with Catherine McGuiness, Chairman of the Policy and Resources Committee, City of London, Maria Leistner, Group Managing Director, General Counsel at UBS, David Bundi, Head RegTech, PwC Legal Switzerland, Angela Yore, MD & Co-founder, SkyParlour, Petra Arends-Paltzer, Founder, Swiss Legal Tech Conference and Manuela Andaloro, CEO, SmartBizHub. In the early afternoon we were joined by an incredible group of change-makers who represent and stand for a new identity of leadership: I had the pleasure to discuss the future of work and the importance of raising awareness on different role models with Catherine McGuiness, Chairman of the Policy and Resources Committee, City of London, Maria Leistner, Group Managing Director, General Counsel at UBS, David Bundi, Head RegTech, PwC Legal Switzerland, Angela Yore, MD & Co-founder, SkyParlour, Petra Arends-Paltzer, Founder, Swiss Legal Tech Conference. What is the status quo when it comes to women in finance and role models. Is work working against us? Of the CEOs who lead companies on the 2018 Fortune 500 list, just 24 are women. That translates into a 4.8%, down 25% on 2017. Why? Increasingly research suggests that one of the key reasons why women do not rise to the top in the same numbers as men is due to systemic barriers, funneling one particular type of person to the top, and that is not usually a woman. Because of this, the focus should not be on integrating into a not-so-good system, but on transforming it and improving it. This is where often initiatives such as “lean in” leave many women wondering, should we lean into a system that is entrenched in a working world that’s outdated, limited and controlling, or should we instead go deeper and work on changing the culture? New role models are crucial to break the cycles of outdated cultures, inspiring women and men to a new identity of leadership, one that leverages skills such as collaboration, empathy and trust, helping younger generations of women and men to rise to a new type of leadership, one that doesn’t take only one form. The FinTech scene has gained increasingly attention over the past two years, its evolving trends seem to foster a culture of gender equality and to act as a catalyst for diversity. 1. Average percentage of senior women employed at FinTech companies is 37%. 2. Average percentage of women in the C-Suite at FinTech companies is 19%. Better, but still not shifting the needle. And yet, the impact of women on the financial services industry and FinTech is more pronounced than in others. Because organizational leadership often strongly influences product development and overall customer experience, FinTech companies with women executives are better positioned to respond to the needs of female customers, a major market segment with potential for growth that is frequently underserved by financial services providers. So, is it possible that the so called “new finance” is helping to shape a new culture around the future of work, and having a significant impact on the success of the industry itself? Q. Catherine, you chair the committee responsible for policy, strategy and direction for the City of London Corporation, you regularly meet with government and financial representatives from across the UK and the EU. What is the gender ratio at senior level you see in your role and also, if we look at the blending of work and life, it has never been more apparent than in today's always-connected and always-on culture, do you think the new generation’s quest for a better “work-life integration” will help changing the status quo permanently in the long run? A. In the Square Mile we have 37% of women in the workforce. This needs to improve. The current mentality is still all “suits and ties”. However the millennials and younger generations are changing this by demanding flexible working patterns, and bringing even greater diversity. As a woman in my role: when I first started there was pressure for me to represent diversity, be a role model. This is not what I wanted, I was there for my role, irrespective of gender, it didn’t feel comfortable to be an advocate initially, but then I soon saw evidence in the workplace that women really were not being treated equally to men, when it came to promotions for example, so I decided I would step in and stand for gender equality and diversity. Q. Maria, when it comes to career and employment, women and men increasingly want to be inspired by real life leading examples, in an effort to implement a permanent cultural change. There is however a lack of leadership models that stresses women’s hearts and minds when pursuing a career. What role do you think the cultural element and the belief that “they will not manage it” plays in convincing many women to avoid the experience of motherhood, or to drop their careers? A. Countries are different in what is culturally acceptable. I lived in the UK for a long time and have recently moved to Switzerland. There is no perfection anywhere on the topic if equality and diversity, however there has been some improvement in flexibility for women in leadership positions. The stats mentioned with regards to women in FinTech are very disappointing. Technology itself and the tech world are a potential driver of change of diversity: it is a chicken and egg situation. Diversity and inclusion can significantly improve the FS sector. If we don’t change how we work, we won’t be able to address the needs of clients. Like Catherine, initially I resisted the role model label for many years, then came to realize that it is a duty, helping to change the status quo and raising awareness on the unconscious bias deeply embedded that plague the workplace and its culture. Q. David, If what we read and hear about millennials holds true, they don’t seem to be driven by the thought of working hard for the next 40 years and then retiring. Rather, they are driven by the idea of building a life and career that can withstand the continuous reinventions that the 21st century will require. They take a lot of criticism in the media for sporting a sense of entitlement, but seem to have interesting strenghts such as embracing change, especially technological, wanting to work smarter, not harder, embracing their passions, professionally and personally. What do you think we can learn from their stance on work and life and how can we implement it sustainably in our working cultures? A. A very interesting quote of Steve Jobs that comes often to mind is “You need to find what you like.” The workforce of the future and the culture we create and bring forward must focus on how we can complement each other. The key is, what makes each and everyone special? The younger generation should be credited for their willingness to try and test. We should be looking for and hiring employees who don’t replicate what we do. The digitalization of business has changed the nature of how we work – and, accordingly, what skills we need to succeed, so even more so, the vital skills in the future will be around the human element and EQ. Personally I have a very good experience with diversity: it simply works and it impacts positively the business and its bottom line. We as panellists, as advocates, need to be bold and supportive to push diversity. Q. Angela, while the world is a considerable distance away from achieving complete gender equality, the Nordics have emerged as a front runner. When people think of countries like Sweden, stylish designs and minimal lifestyles often spring to mind, but gender equality is one of the cornerstones of modern Nordic society. These countries continuously stand out in the Global Gender Gap Report, which measures equality in all areas from education, employment to economics. Out of these countries, Finland has the largest female labour-force participation, as 83% of women, including mothers, work full time. What do you think has worked well in these countries that could be replicated across Europe? Also, do you think quotas play a part in their success? A. Nordics have it right: The culture is there, policies are strong and enabling. Both elements are required. They are not present in a similar way in the UK, or elsewhere in the EU. In the Nordics for example, 10% of income is spent on child care, that percentage increases to 35% in the UK. Culture eats strategy for breakfast. As CEO of my own company, I now get to make decision and stand for what I believe, but initially as senior woman in the tech corporate world it was tough, when I announced my pregnancy to my then boss, his comment was: “ Oh dear, Angela, this changes everything”. I will let you digest that. I set off and started my own business and have never looked back. My advice to women, and men, who don’t fit in outdated cultures is simple: Be bold. It usually pays off. Q. Petra, if we look back at 2008 and the financial crisis, a famous statement of Christine LaGarde (Managing Director and Chairwoman of the International Monetary Fund) still holds true: “if it had been Lehman Sisters rather than Lehman Brothers, if would still be here”. That obviously points at the fact that women are normally more risk averse than men, however, that often has an effect on their careers and the risks they take, not going for “that” job or not doing really positioning themselves and their value in their organization. What are the key drivers for change? A. The key driver will be a change in client demand: Clients will seek out companies with diverse workforces. We have an incredible enabler these days: technology. Technology will work towards gender equality. In all this, role models will be vital to inspire women and men. Another vital element is to step out of the comfort zone, to ask, to demand equality. Self-confidence to genuinely establish themselves is a key factor, and so is genuine collaboration among women. Q. How does performance affect the diversity drive? Angela. The gender pay gap is disastrous. Take BBC News presenters: same role, same experience, male TV anchors earn 30% more than their female counterparts. What is the rationale? Q. How do you feel about the pressure on males to hire female or face discriminatory allegations? Maria. It is about the quality, of course performance is critical, pushing for diversity to get things moving more quickly might lead on certain occasions to errors. Personally, I am in favour of quotas. 10 years ago I was against but the speed of change on the gender equality topic has been too slow not to resort to quotas. Catherine: I am personally in favour of targets rather than quotas. But targets with teeth. Culture is what we need to address most of all. Targets with teeth. When discussing the importance of gender equality in the workplace, concrete rather than glass ceilings, and bias embedded in cultures that belong to history books. Corporate culture creation, improvement, and change rests with the organization's top leaders. Through their actions, communications, and the values they embody, leaders set the example for others to follow, and the tone for what is important and valued in the organization. The good news is that CEOs and supporting executives across the globe are realizing that corporate culture is not simply a feel-good catch-phrase, but rather the linchpin to an organization's overall performance. Once CEOs embrace their role in establishing and leading the corporate culture, the sky is the limit for both personal, organizational and societal potential.